Over the last two months we have been piloting new methods for calculating the right bed occupancy for non-elective beds. I will be writing about the methods in more detail over the coming weeks, but thought you might like to see some of the initial results that have been coming out. 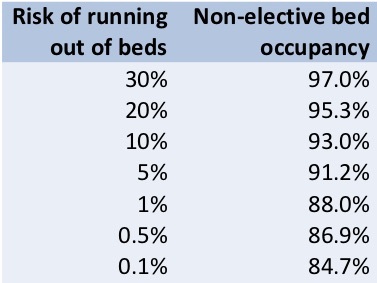 For each non-elective bed pool (main beds, maternity, etc) across several hospitals we have calculated the relationship between bed occupancy and the risk of unexpectedly running out of beds. The analysis takes into account the local unpredictability of non-elective admissions from one week to the next, as well as variations in bed usage during the week. For instance the following table shows how risk varies with bed occupancy for the main wards of a particular general hospital. A 1% risk means that, as the months go by, they would have run out of beds unexpectedly 1% of the time. That’s for the main ward block, but as you might expect, the numbers are very different in maternity and in smaller hospitals. Small bed pools are more vulnerable to random variation than large ones, so they need a lower bed occupancy to achieve the same level of risk. Also the pattern of variation differs between different places, so the numbers must be calculated separately in every situation. You can immediately see why ‘magic numbers’ like 85% and 92% are unhelpful – the right bed occupancy depends very much on the local situation. You will also notice that these numbers are a good deal lower than real life bed occupancy in much of the NHS at the moment. So our analysis goes on to look at the potential benefits of improving morning and weekend discharges, and the longest lengths of stay to improve the risk of running out of beds. If you’ve done what you can, and end up with a higher bed occupancy than you would like, then at least you can understand and communicate the level of risk you are accepting (or, if you are a commissioner, the level of risk you are commissioning for). So when you are planning and scheduling elective activity around the emergency peak, you are working with a known level of risk that some patients might be cancelled at short notice. This more nuanced approach challenges another NHS institution – the January elective shutdown. There is of course nothing magical about the 31st of January… non-elective pressures rise and fall, but they don’t pass the same threshold on the same day in every hospital. With better analysis you can plan elective activity right through winter with more sensitivity to local circumstances. If you would like to know the right bed occupancy numbers for your hospital then get in touch. We’ll be happy to work with you towards a calmer winter, a less congested A&E, and no elective shutdown in January.